a book chick: "The Slow Down Diet"
my take: I've read this several times. 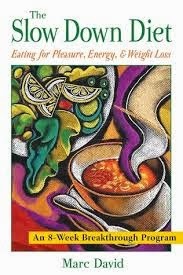 Marc David is a pioneer in the field of the psychology of eating. It's a good read with many client stories to illustrate his suggestions. It's a revolutionary way of approaching food and has changed the way I eat and think about food. I use this as the source for teaching nutrition in my life skills class and it never fails to surprise and inspire the ladies. They love learning about Vitamin O and Vitamin P. You might, too. my source: Jill Tanis. Thank you.